With 20 million users and over $200 million in backing from venture capital investments, Coinbase is the biggest and most well-funded digital currency exchange on the market today. Coinbase has leveraged its venture capital money to obtain a number of regulatory certifications, including New York’s expensive and controversial BitLicense. And with four security-related patents, Coinbase has emerged as an information security leader. Unlike many of its competitors, Coinbase is convenient and easy to use. Customers that live in the US or Europe can fund their accounts with ACH or SEPA bank transfers. However, residents of Australia and Canada will likely want to go with a different digital exchange. Coinbase users in those countries can’t sell digital currency on Coinbase. In addition, fees can be quite high and the system that Coinbase uses to calculate those fees is hard to understand. Also, Coinbase lacks margin trading functionality and other advanced trading tools. Easy-to-understand interface and signup process. Coinbase owns four security-related patents. 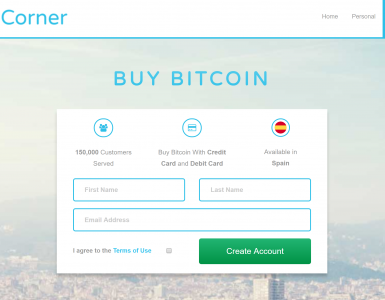 “Local currency wallet” feature makes it easy to buy digital currencies. Information about fees is provided at the time of transaction. Coinbase uses a confusing system to calculate fees. Digital currency selling is not allowed in many Coinbase regions. Margin trading and other advanced trading options are not supported. Keep reading our detailed Coinbase review to find out whether or not it is the right place for your virtual currency trades. Update: In August of 2018, Coinbase enabled a new feature called instant trading, which lets users begin trading as soon as they deposit funds. Coinbase also increased the daily trading limit for verified US-based customers to $25,000. In episode 35 of the Foundation podcast, Coinbase co-founder Brian Armstrong described how he immediately recognized the importance of Bitcoin after reading Satoshi’s Bitcoin whitepaper in 2010. 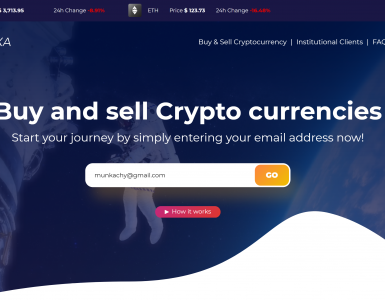 After Armstrong met British programmer Ben Reeves on a Bitcoin forum, they pitched an idea for a digital currency exchange to startup accelerator Y Combinator. Within hours, they received an invitation to join the Y Combinator class of 2012. Wired reported that the partnership between Reeves and Armstrong proved to be extremely short-lived. In order to gain legitimacy, Armstrong felt that Coinbase would have to provide a way for its users to recover their passwords– but Reeves thought that the centralization that Armstrong’s plan entailed carried too many inherent risks. Hours before Armstrong left for Silicon Valley, Armstrong and Reeves parted ways. Armstrong later encountered a new partner via Reddit, a former Goldman Sachs trader named Fred Ehrsam. Ehrsam was involved in a pivotal moment in the history of Coinbase when FinCEN (Federal Crimes Enforcement Network) issued guidance to digital currency exchanges in March of 2013. FinCEN had stated that Coinbase and other digital exchanges should be considered “money transmitters” and should comply with state licensing, federal registration and comply with Bank Secrecy Act regulations. Ehrsam called FinCEN to get more information and find out how Coinbase should react to the guidance. After deciding that following instead of contesting the guidance would be good for the Coinbase brand, Ehrsam and Armstrong decided to find ways to comply. That expensive but forward-thinking decision paid off. Coinbase’s pro-regulation stance helped the company attract venture capital funds from IPV Capital, Union Square Ventures and Andreessen Horowitz. Today, Coinbase is the largest digital exchange in the world. Brian Armstrong – Co-founder, CEO. Armstrong is the public face of Coinbase. Fred Ehrsam – Co-founder. Ehrsam worked at Goldman Sachs before he came to Coinbase. Ben Reeves – Co-founder. In addition to co-founding Coinbase, Reeves also founded blockchain.com. He and co-founder Fred Ehrsam are no longer with Coinbase. Mike Lempres – Chief Risk Officer. Lempres is in charge of Coinbase’s internal financial operations. Before he got involved with digital currency, he was the Assistant General Counsel and Practice Head of Silicon Valley Bank. In 2015, Coinbase raised $75 million in Series C funding. DFJ Growth led the round, and was joined by The New York Stock Exchange, USAA, BVA, NTT Docomo, Valor Capital Group, Vikram Pandit, Tom Glocer and Carlos Rodriguez Pastor. In 2017, Coinbase made headlines again for racking up another $100 million in series D funding. That round was led by IVP, the same firm that had previously invested in Dropbox, Netflix, Twitter, Slack and Snap. Other prominent investors included Spark Capital, Greylock Partners, Battery Ventures, Section 32 and Draper Associates. Coinbase is registered with the US Treasury’s FinCEN (Financial Crimes Enforcement Network), which gives it the ability to operate in most US states. The exchange has posted a list of all of its US state licenses to its website. In addition, Coinbase complies with the United States Bank Secrecy Act and the USA Patriot Act. All US assets are stored in “pooled custodial accounts” in FDIC-insured banks. Coinbase became the 3rd digital exchange to earn a BitLicense certification in January of 2017. During the same period of time, Coinbase hired Chief Risk Officer Mike Lempres. Lempres brings extensive regulatory experience to the company. He was appointed by three different US presidents and served as the Assistant General Counsel of Silicon Valley Bank. In December of 2017, Coinbase took out an insurance policy. Coinbase’s insurance policy covers losses resulting from employee theft and physical and cybersecurity breaches. Coinbase does not accept most altcoins. The only cryptocurrencies available on Coinbase are Bitcoin, Bitcoin Cash (a hard fork of Bitcoin with a larger block size that debuted in August 2017), Ethereum and Litecoin. Since its inception, the U.S. Patent and Trademark Office (USPTO) has awarded Coinbase four security patents. 2FA (2-Factor Authentication) is mandatory. Options include Authy App, Authenticator and SMS. In 2014, Coinbase partnered with Hackerone to debut a bug bounty program. The bug bounty program allows white hat hackers to earn up to $50,000 for identifying weaknesses in Coinbase’s security system. Coinbase has paid over $250,000 in bounties as of March 2018. Despite Coinbase’s high security standards, several high profile Coinbase account holders have succumbed to hackers. Former Lifehacker writer Adam Dachis lost $10,000 worth of cryptocurrencies when hackers targeted his Coinbase account in May of 2017. During the same time period, IRL VR founder Cody Brown lost $8,000. Both hacks were not Coinbase’s fault. In both cases, the hackers manipulated phone companies to gain access to the wallet. However, both victims criticized Coinbase because its security systems did not detect that anything suspicious was happening. Coinbase offers support through their ticket system, Twitter, Reddit and a 24/7 support hotline. There’s also an automated chatbot you can use to find answers to frequently asked questions. Like most digital exchanges, Coinbase experienced a tremendous amount of growth last year. As a result, the customer support team has prioritized issues having to do with account compromises, account lockouts and delayed payments/orders. 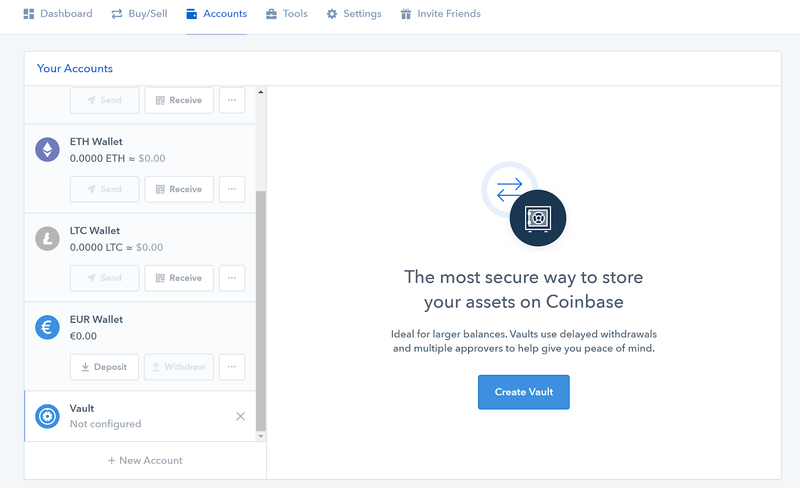 The backlog of customer support issues has alarmed many Coinbase customers, but the Coinbase support team has attempted to address those issues publically via the Coinbase blog and on social media. Coinbase is available in 32 countries: Singapore, Australia, Austria, Belgium, Bulgaria, Croatia, Cyprus, Czech Republic, Denmark, Finland, Greece, Hungary, Ireland, Italy, Jersey, Latvia, Liechtenstein, Malta, Monaco, Netherlands, Norway, Poland, Portugal, San Marino, Slovakia, Slovenia, Spain, Sweden, Switzerland, United Kingdom, Canada and the United States. 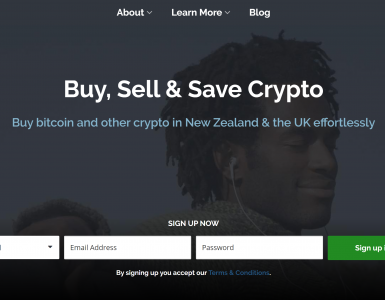 However, Canadian and Australian Coinbase users cannot initiate sells. All Coinbase account holders have to verify their phone number and email address. Phone numbers and email addresses are verified during the account creation process. In order to deposit fiat currency into your Coinbase account, you have to submit a government-issued ID card. In addition, certain site actions may trigger further identification verification tests. Coinbase occasionally requires their users to submit selfies. A Coinbase knowledge base article about 1099-K Tax Forms mentions that Coinbase offers business accounts. However, there is no information about which documents you need to provide in order to set one up. The only cryptocurrencies available on Coinbase are Bitcoin, Bitcoin Cash (a hard fork of Bitcoin with a larger block size that debuted in August 2017), Ethereum and Litecoin. Coinbase lets most US residents and residents of some European countries set up “local currency wallets.” Local currency wallets enable Coinbase users to deposit US dollars, Euros and a handful of different European currencies. Once you deposit funds into your local currency wallet, you can trade your local currency for Bitcoin, Bitcoin Cash, Ethereum and Litecoin. The local currency wallet feature is available in the following countries: Australia, Canada, Singapore, the United States, the United Kingdom, Austria, Belgium, Bulgaria, Croatia, Cyprus, Czech Republic, Denmark, Finland, Greece, Hungary, Ireland, Italy, Latvia and Liechtenstein. Coinbase only allows simple buy/sell transactions. Margin trading and risk management features are not available. 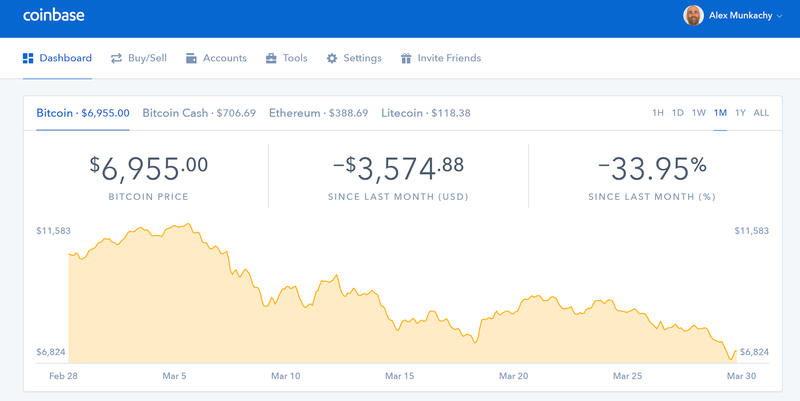 Coinbase has an easy-to-navigate interface. The dashboard shows you the price of Bitcoin, Bitcoin Cash, Ethereum and Litecoin. You can buy or sell any of these currencies by clicking Buy/Sell. If you haven’t added a payment method, the interface will prompt you to set one up. If you plan to use a credit or debit card to make your purchase, you have to identify yourself first by uploading a picture of your photo ID. The Accounts tab lets you quickly and easily deposit digital currency into various wallets via QR codes. If you plan on storing large amounts of currency, you can set up a “vault.” Assets stored in a vault require additional withdrawal steps. Coinbase has apps for Android and iOS. The official name of the Coinbase app is: Coinbase – Bitcoin Wallet. Both official apps list “Coinbase, Inc.” as the publisher. All Coinbase users can purchase digital currency with credit and debit cards. However, there are several caveats: Coinbase no longer supports linking “new” credit cards. Also, many banks have blocked their credit cards from making digital currency purchases. The digital currency deposit/withdraw interface displays both digital currency addresses and QR codes. There are no fees for deposits or transfers between two Coinbase accounts, but there is a negligible fee for digital currency withdrawals to cover bitcoin mining and other expenses. This small withdrawal transaction fee varies depending on the state of the network and is disclosed at the time of the transaction. There are no fees for digital currency transactions within the Coinbase system. Coinbase uses two confusing “methods” to calculate its conversion fees. Method 1. In this conversion fee method, you’ll get either an unspecified “minimum fee” (for transactions under $200) or a percentage fee, whichever is greater. The fees vary depending on your geographical location. Method 2. Under the second fee method, there is a single percentage fee. The percentage fee consists of two parts: a fixed fee (2.49%) and a 1% variable fee. The variable fee maxes out at $50 and the minimum charge is $1. Again, the fee varies depending on location. Customers in some regions have to pay both the fixed fee and the variable fee, but customers in other regions only have to pay one or the other. In both methods, US-based Coinbase customers must pay extra. Under method one, US customers pay 4% extra on top of other fees. Under method two, the base conversion fee for US customers is the percentage fee (fixed fee + variable fee). The knowledge base article does not state exactly how Coinbase decides which method to use to charge for fees. However, it does say that Coinbase will disclose all charges at the time of the transaction. Smart money is investing in Coinbase and it’s not hard to see why. It’s only one of a handful of BitLicense certified exchanges, plus it has excellent security as well as a good blend of features for advanced and new traders. Coinbase’s intuitive interface and knowledge base articles make it easy for beginners to buy digital currency. Other convenient features include credit/debit card purchases and bank deposits and withdrawals. The fees are somewhat high, however, and the fee scheme is complex. However, the Coinbase interface shows you the charges you’ll be paying at the time of purchase. Advanced digital currency traders might be put off by the lack of altcoins. Coinbase also lacks margin trading functionality and risk management tools. On the other hand, Coinbase does provide form 1099-K to some of its business customers, as well as a new tax report feature called Cost Basis for Taxes is in beta.